Lucy Skywalker put an interesting link in the thread of the new just released GISS emails. While not as dramatic, there are interesting details in these as well. The GISS adjustments are highly questionable on their basis in my opinion but not necessarily wrong out of hand. They do go in the direction we have come to expect. In this case though, you can see the dramatic progress toward shifting the 1934 temperatures downward. When you consider that 1934 was at one time .5 C higher than 1998 and over the years was repressed until they were equal – this is for the US only 2% of global area. Currently the global trend over that time is about 0.5C. 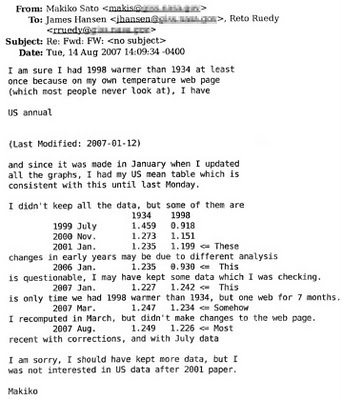 Here is a plot of this climategissgate email from the Virtual Philosopy club linked above. Why are all the adjustments in the same direction every time we bother to look. I really have a hard time believing all of this was done with intent but my god the constant battering on my senses. What are we supposed to think. This entry was posted on January 15, 2010 at 12:37 pm	and is filed under Uncategorized. You can follow any responses to this entry through the RSS 2.0 feed. You can leave a response, or trackback from your own site. I’m sure that all the people living in the U.S. in 1934 will be glad to hear about this change. Maybe they can turn off their attic fans now and get with green energy program and help make the present cooler. I do feel sorry for the ice and ice cream vendors, though. Their sales will need to be adjusted downward. The temp (unadjusted of course!) hit 110 degrees on July 25, 1934. Holy cow! Do those weather conditions sound anything like what was experienced in any year during the decade from 2000 to 2009? Of course and I think you do not need to make out of hand, crazy, wrong adjustments to generate a 0.7c over a century… and that’s the crux of the matter. As an analogy, I think you are arguing the difference between 1st degree murder and reckless homicide. The population and economies of the world have been increasing monotonically over the entire temperature record. The urban heat island effect is well known and has unquestionably caused an increase in recorded temperatures and there must be an upward trend in the bias of the recorded temperatures. Therefore any realist correction to the temperatures must show a lower upward trend than the raw data when average of all the recording sites is considered. The team has never openly done this simple sanity check on the raw data vs. their homogenized data. Now they intentionally hide the raw data so no one else can do this simple test. They are trying to hide the evidence. At a minimum they are are guilty of absolute reckless disregard for the truth. Given the funding they have been entrusted with, and the intentional harm to the fossil fuel industries, (death trains ring a bell?) I can barely tolerate it when someone starts to give them the benefit of the doubt. Amazing. Doe sit really matter if the climate warmed, cooled or pretty much has not changed temperature over the past 100 years? Given it’s well withing the normal operational parameters of natural variability that we have determined over the previous 100’s and 1000’s of years there’s nothing to be alarmed about. The question then is what is going to happen over the next 100 years. Anyone who says they know the answer to that question is a liar. Pure and simple. You should continue the graph out to 2010. NASA are now showing 1934 at 1.26 and 1998 at 1.29. So, since 1999, 1934 has been reduced by 0.2 degree, and 1998 increased by 0.37 degree, so a relative change of 0.57 degree. 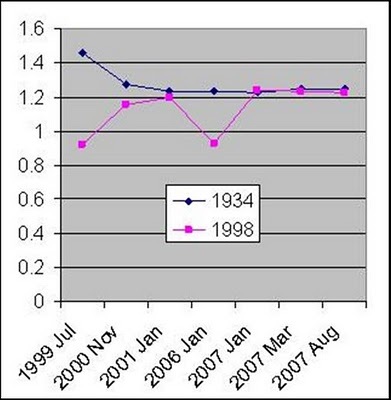 What’s more, 2006 is sitting at 1.29 as well, so now they can claim two recent years hotter than 1934. Indeed, they can torture the numbers until they confess exactly what they want. IMHO, James Hansen is the Homer Simpson of climate science. Does anyone stop to think that this is all about a warming of 1 degree over the last 100 years? I just went through a review of the 9 pages of references, a total of 537 papers, on Chapter 9, Understanding and Attributing Climate Change, of the IPCC 4th Assessment Report AR4. I did not read all of the papers. From the titles, I selected those that appeared to address attribution. By searching the web by the title, I was able to find the abstract on nearly all of the papers and the complete PDF on most of the papers. I COULD NOT FIND ANY PAPERS DESCRIBING ANY EMPIRICAL EVIDENCE OF ANTHROPOGENIC GLOBAL WARMING (AGW). To put it in context, it reminded me of a debate among theologians about how many angels can dance on the head of a pin. The evidence behind AGW amounts the Argument from Ignorance, the models using (their definition of) natural causes alone cannot replicate the observed global warming, therefore, it must be caused by humans. The models have been calibrated to predict past climate, but what good is that? The UK Met office has been pilloried for their predictions of a mild winter and none of the many climate models predicted a decade without any warming. Now the AGW alarmists have finally discovered NATURAL VARIABILITY! If the 20 errors are against us we’ll let everyone know, in a very disgruntled voice, just how awful the bank is. Now, if the bank tossed all their accounting records (as did CRU with the raw data) does anyone think that they would be congratulated by the media and government? it is there for all to see!!!!!!! Having looked at temp data and the work of others one of the issues for me is using a 1979 – 2000 or 1951 – 1980 base period to convert temperature to temperature anomalie. Using these peroids the more modern period of station records will tend to agree better with the earlier temps having more variation. Homogenisation is then used to “match” them up i.e. to remove non-climatic trends. But, if you use only long station records and say a 1900-1930 base period, then homogenisation the urban stations that been warming faster with the rural stations you get a very different answer. But both can arguably be correct methods. Fact is we will never a get a true picture, and everything should be taken with a pinch of salt. A valid method may give the right or the wrong answer! Was the 1930’s warmer? I suspect it was similar to current temps, if not a little warmer and I suspect that goes for a lot of the globe.